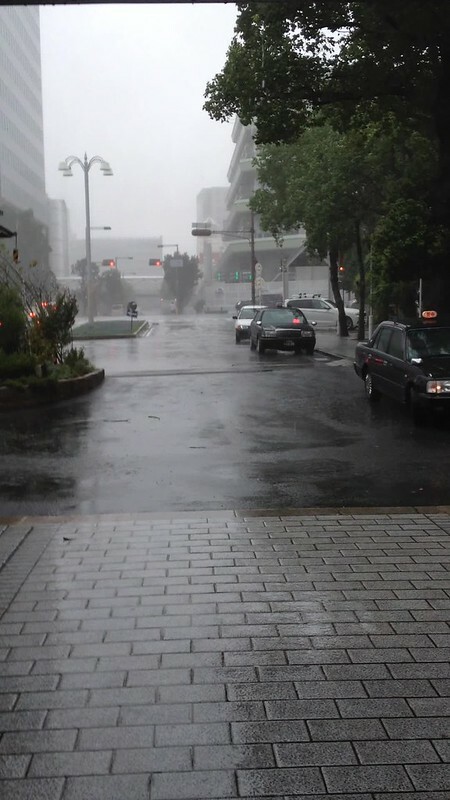 Update: The typhoon passed quickly by Japan, crossing the island in few hours. Here is a short video of the peak winds and rain from the lobby of our hotel. There were a few branches down and everything got very soggy, but overall, it was just a bad storm and nothing exceptional. The family slept through most of it, battling jet lag. We arrived in Osaka a couple of hours ago and are cozy in our hotel. We got in just in time as many flights are being cancelled due to Typhoon Halang which will hit the Japanese mainland in a couple of hours. 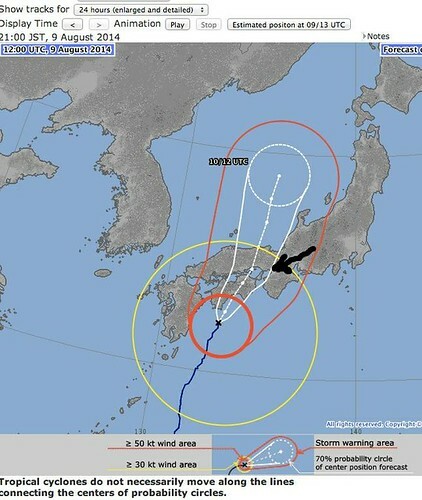 As you can see from the screen shot above, Osaka is located at the tip of the arrow. Halang, with winds gusting up to 180 km/hour is between a Category 2 and 3 on the Saffir-Simpson Hurricane Scale. That means there will be heavy rains and winds, and expect some trees and wires to fall. The weather was quite cool with a nice breeze upon our exit from the airport, which is one of the nice things – the heat and humidity of the Japanese summer has dissipated, at least for the weekend. We are very tired after the 14-hour flight. I’ll try to take some video tomorrow if possible as it is almost 11:00 PM here in Osaka. The Japan Meteorological Agency has an excellent website in English which I will be checking often during my stay here. It also covers earthquakes, weather, and ocean data. Good night and we’ll see what tomorrow will bring. I’m envious, once again–you’ll love japan. Can’t believe your US visit didn’t include a caspian stop! You are right, it was unfortunate we didn’t make it to my beloved Caspian. I am working on my Doctorate at Lehigh University and spending time with my biological family. It is expensive to fly with three children… How are you doing?